Good news for all of us! Whether or not you’re enjoying exercising, scientists have developed new technology that makes working out more enjoyable than ever. The new study also found that it makes us more resistant to pain. Researchers at Max Planck developed a new fitness technology called Jymmin that makes us less sensitive to pain. Credit: Max Planck Institute For Human Cognitive and Brain Sciences. Researchers at Max Planck Institute for Human Cognitive and Brain Sciences (MPI CBS) developed a new way of working out: they altered fitness machines to produce musical sounds during use. Scientists discovered that this novel approach, which they call Jymmin, increases pain threshold and makes people less sensitive to discomfort. “We found that Jymmin increases the pain threshold. 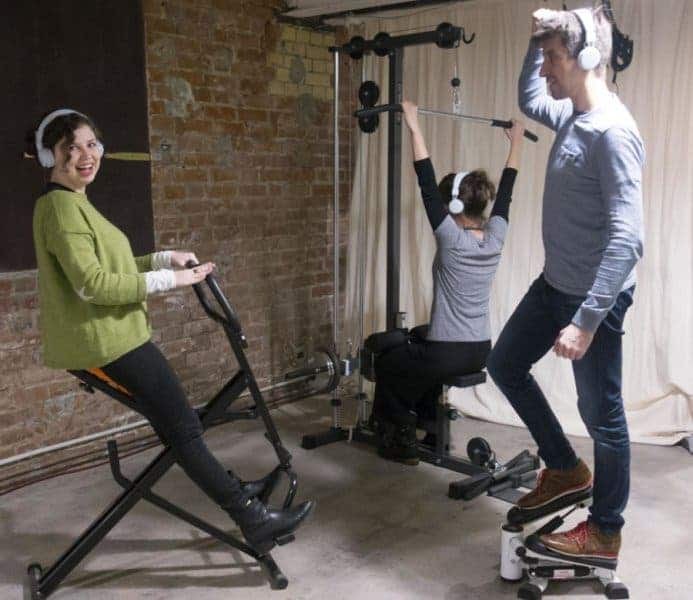 On average, participants were able to tolerate ten percent more pain from just ten minutes of exercise on our Jymmin machines, some of them even up to fifty percent”, said Thomas Fritz, head of research group Music Evoked Brain Plasticity at MPI CBS, in a press statement. Scientists paired music composition software with sensors attached to the fitness machines. While exercising, the sensors captured and then transmitted signals to the software, which played back an accompaniment from each fitness machine. Basically, the researchers modified steppers and abdominal trainers to become our own musical instruments, so you can get really creative while working out. Researchers discovered that, after Jymmin, participants were able to immerse their arms in ice water of 1°C (33.8°F) for five seconds longer compared to a conventional exercise session. Scientists believe that the pain resistance experienced by the participants is due to the increased release of endorphins. Apparently, if music composition and physical activity are combined, endorphins are flushed into our systems in a more efficient way. Researchers divided all 22 participants according to how they rated pain and discovered that participants with the highest pain threshold benefitted the most from this training method. Maybe this happens because these participants already release endorphins more effectively in comparison to those who are more pain sensitive. “There are several possible applications for Jymmin that can be derived from these findings. Patients simply reach their pain threshold later,” Fritz added. Jymmin could do wonders in treating chronic or acute pain. It could also be used as support in rehabilitation clinics by enabling more efficient training. Scientists tested top swimmers in South Korea and the results were remarkable: athletes who warmed up using Jymmin machines were faster than those using conventional methods. In a pilot test, five of six athletes swam faster than in previous runs. Previous studies showed that Jymmin has many positive effects on our well-being. They revealed that personal mood and motivation improved, and even the music produced while Jymmin was perceived as pleasant. Scientific reference: Thomas H. Fritz, Daniel L. Bowling, Oliver Contier, Joshua Grant, Lydia Schneider, Annette Lederer, Felicia Höer, Eric Busch, Arno Villringer. Musical Agency during Physical Exercise Decreases Pain. Frontiers in Psychology, 2018; 8 DOI: 10.3389/fpsyg.2017.02312.